After the city-wide cleanup kickoff in April and our first neighborhood cleanup in May, join us Saturday, June 18th at DiSilvestro playground (on 15th between Morris and Castle Sts.) for a quick sprucing up of the area. We'll focus on DiSilvestro and the rest of the block around the library and health center, depending on turnout. 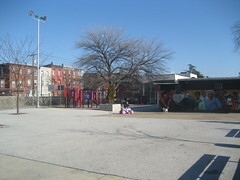 Residents who live on the surrounding blocks or who have children they bring to the playground are encouraged to show up and bring other parents. We'd like to come up with a short-term plan for watering the flower beds and submitting SeeClickFix/311 complaints until the renovations on the Rec Center are complete. At the April NNA General Meeting, Steve Goldman (manager of Parks & Rec recreation district #7) joined us with an update on the construction at the DiSilvestro playground and recreation center and to answer questions from those in attendance. The construction is on-going, and is taking longer than expected because of previously undetected roofing and asbestos problems. He expects the Rec Center to reopen in September, but was unsure how soon after opening it would have a full-time staff member. He acknowledged that construction sites are very hard to effectively fence off, especially for enterprising young minds, but that they are making efforts to keep the site clear and safe. Revive the 'Friends of DiSilvestro' group to help maintain a presence in the park through cleanups, flower beds, etc. Please let us know if you live close to the park and would be willing to be a part of the Friends of DiSilvestro group.